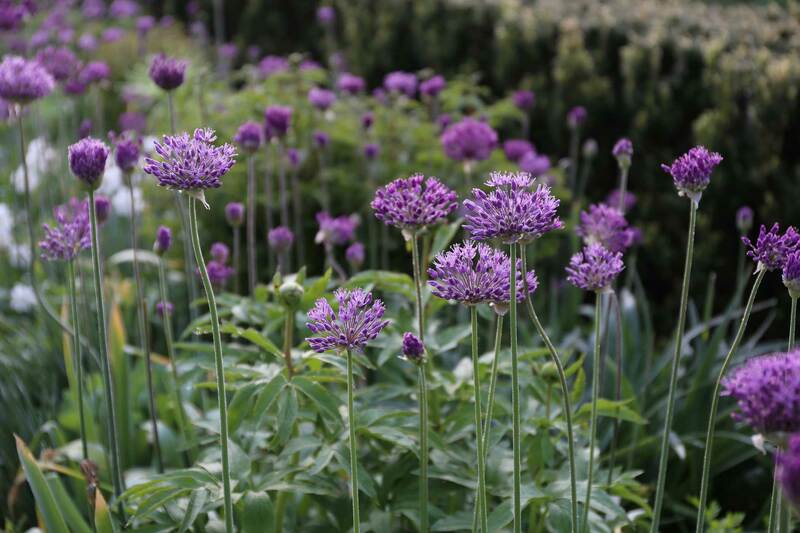 Every garden looks better with alliums. Their globe-like flowers are big attention-getters that add structure, motion and personality wherever they are planted. These fall-planted bulbs will grow almost anywhere. They’re not bothered by deer, rabbits and other garden pests, yet they are magnets for bees and butterflies! 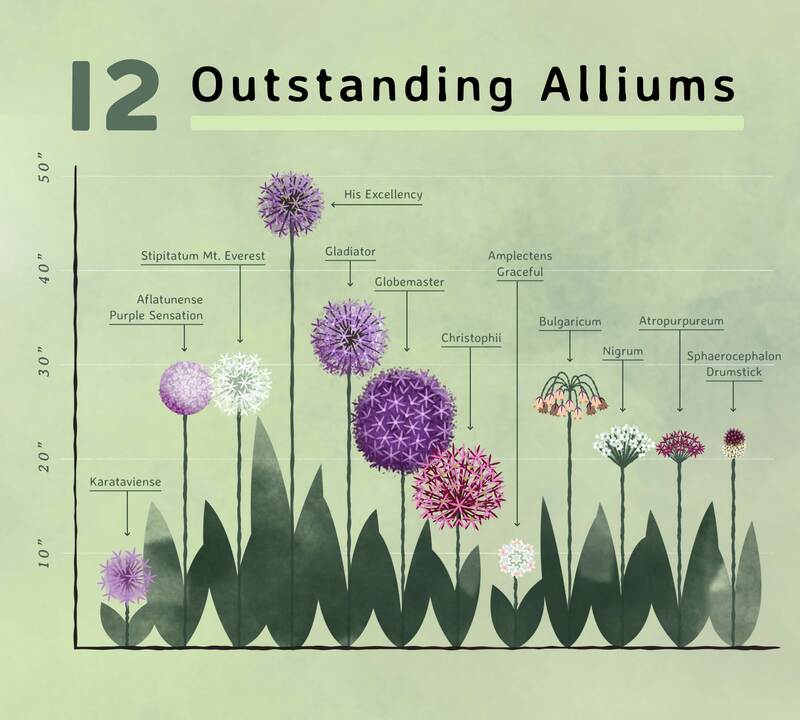 Many gardeners don’t realize there are many types of alliums. With a little planning, you can put them to work in all sorts of creative ways. 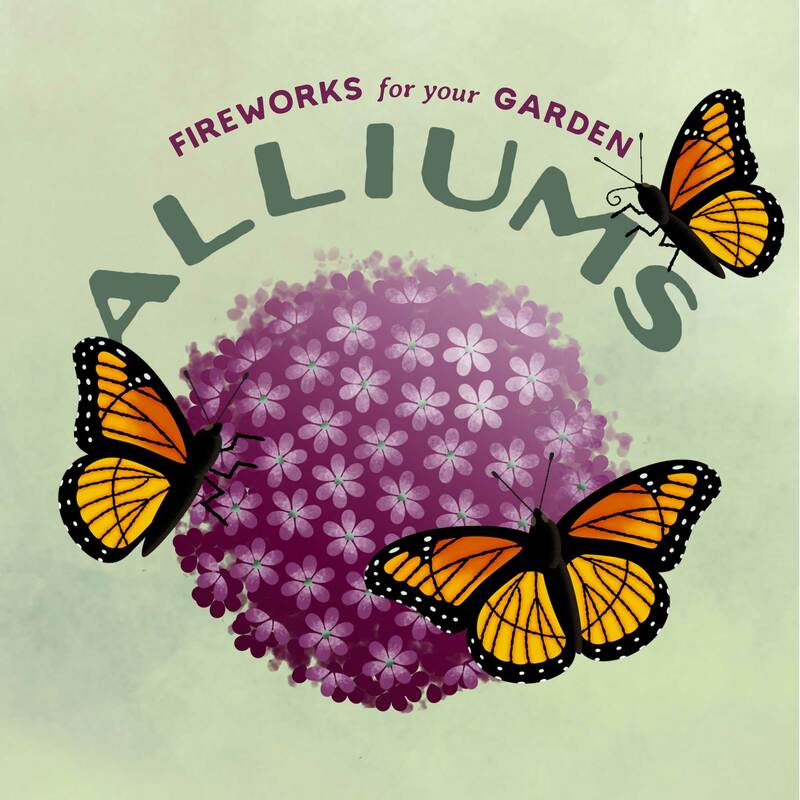 Our new Planning Guide for Alliums makes it easy to visualize how these plants will look in your perennial gardens and other landscaped areas. You can see heights, flower shapes and flower sizes, plus the bloom time sequence from spring through summer. One of the most challenging things about perennial gardening is coordinating bloom times. 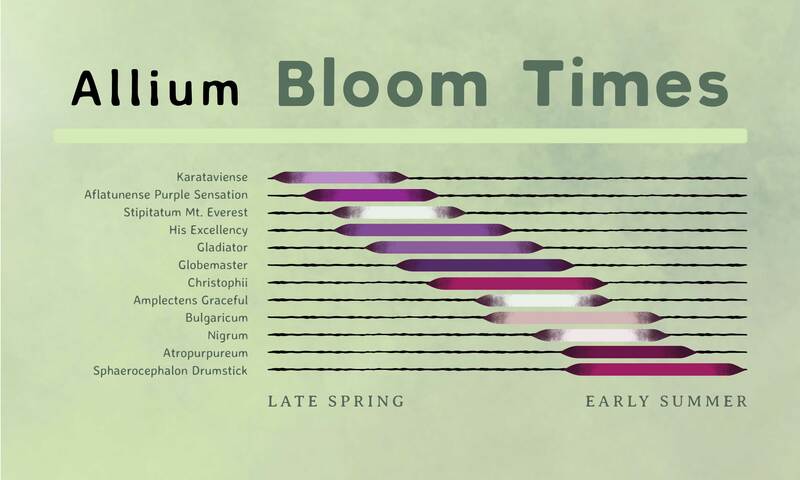 Though it’s impossible to predict exactly when a plant will flower, this visual guide makes it easy to see relative bloom times. 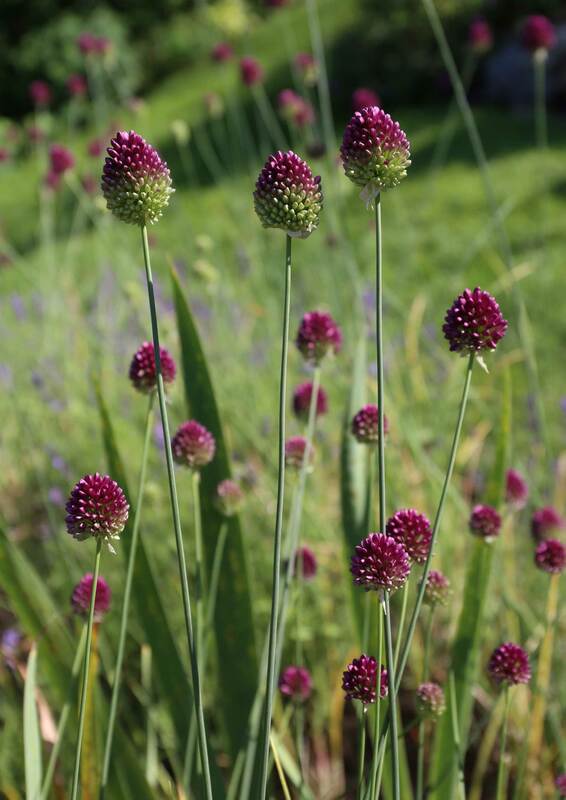 By selecting a number of different species, you can have alliums in flower for as long as possible. Start the parade with Purple Sensation. These blossoms begin opening along with the very last daffodils and late tulips — and just before peonies. The bulbs are small and inexpensive, so it’s easy to plant them liberally! 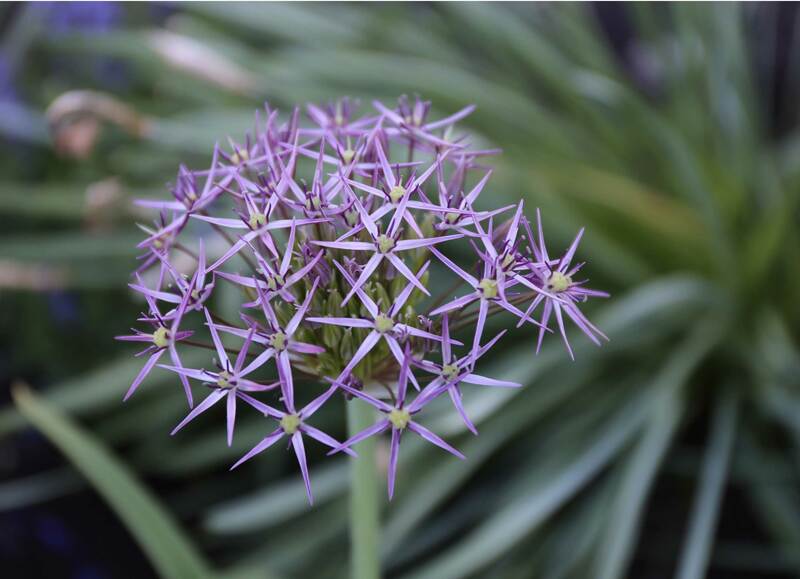 The starry blooms of Allium christophii start opening at peony time. They are the perfect size for the front or middle of a border. Drumstick alliums bloom in early summer. Their egg-sized flowers look best planted in large groups. Big-headed varieties like Gladiator, deserve to be treated as individuals. Give them enough room so you can really see their impressive size. Extra-tall varieties such as His Excellency, tower over other plants. Since it’s easy to see them from a distance, they’re a great choice for landscaping. 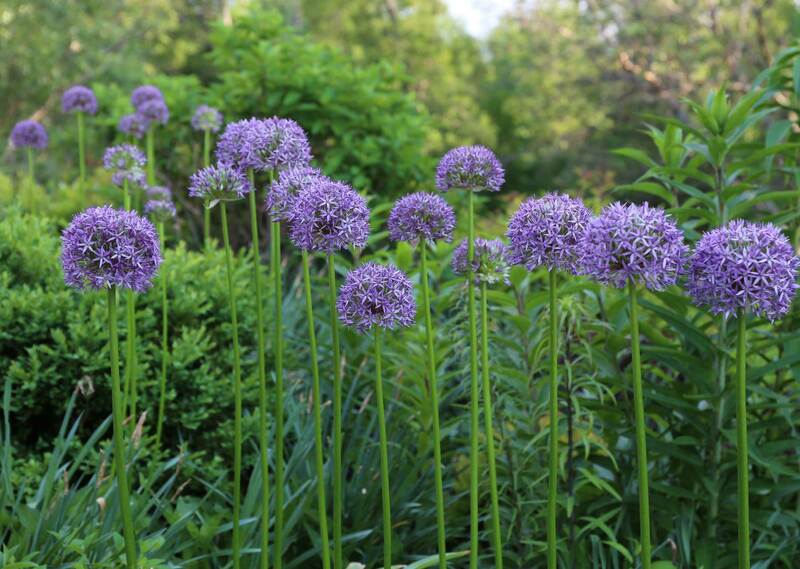 Allium bulbs are planted in the fall — any time from mid-September to late November. Most species have relatively small bulbs, so it’s easy to tuck them between existing perennials. Those with extra-large flowers (such as Globemaster) have golfball-size or even baseball-size bulbs, so they deserve a little extra care with placement and planting. 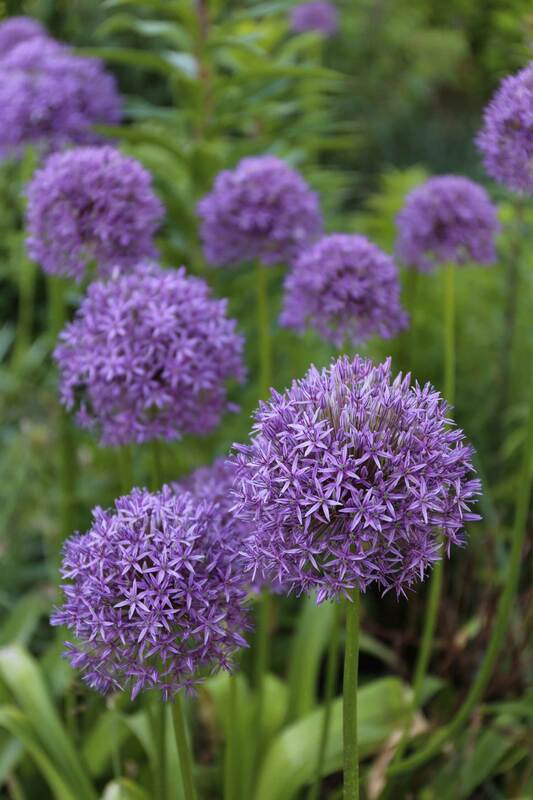 You can find our Planning Guide for Alliums HERE. 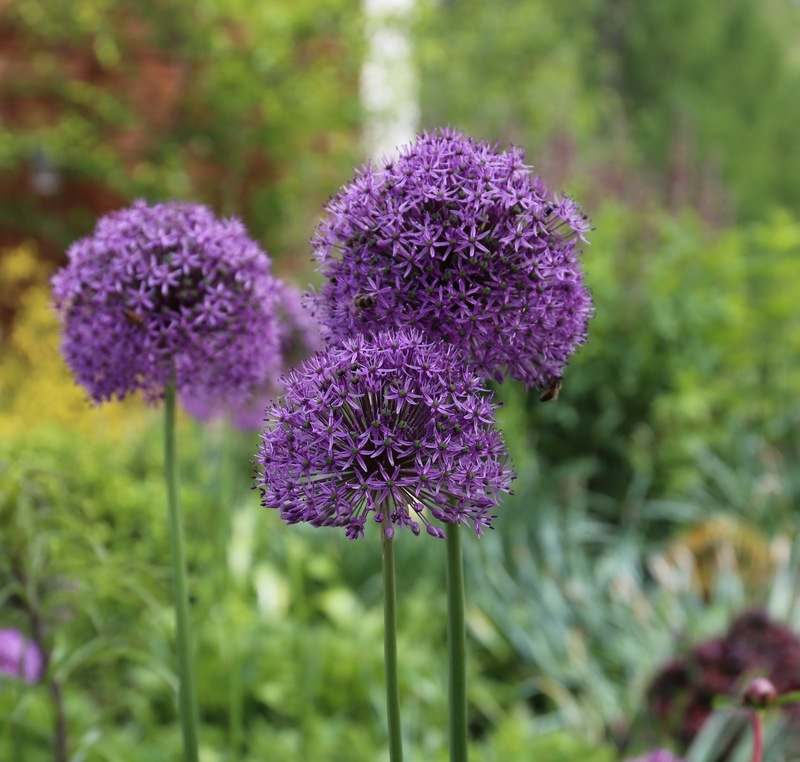 You may also be interested in this video about planting alliums in a perennial garden or in reading this article: All About Alliums. Love your webs site & Kathleen,Look forward to hearing from her. 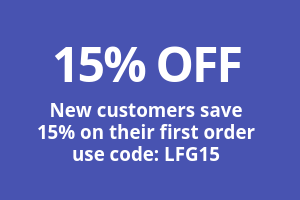 Hope to get order placed before bulbs are gone. Love alliums. Through the course of 20 years I’ve planted around 50 of them at different times and areas in my yard to no avail. Not one has bloomed. Can’t figure out why. I live in zone 8. So sad. Hi Judy – so sorry to hear that. Maybe it’s because you live on the warm edge of their preferred temperature range. Do gardeners in your area need to pre-chill other spring-flowering bulbs such as tulips? If so, you might try doing the same thing with alliums. Good luck! I’m also in Zone 8 (north Louisiana) and I’m planning many alliums for my garden next spring. Should I pre-chill them? And how should I do that? Do you know if I should pre-chill all my bulbs out of precaution? Crocus, Tulips, Hyacinth and Daffodils specifically. I’m aiming for en masse planting. Any advice at all would be so appreciated! I’ll go read the link you posted now! Hi – Pre-chilling bulbs is extra work and it would be nice to avoid that step if it’s not necessary. 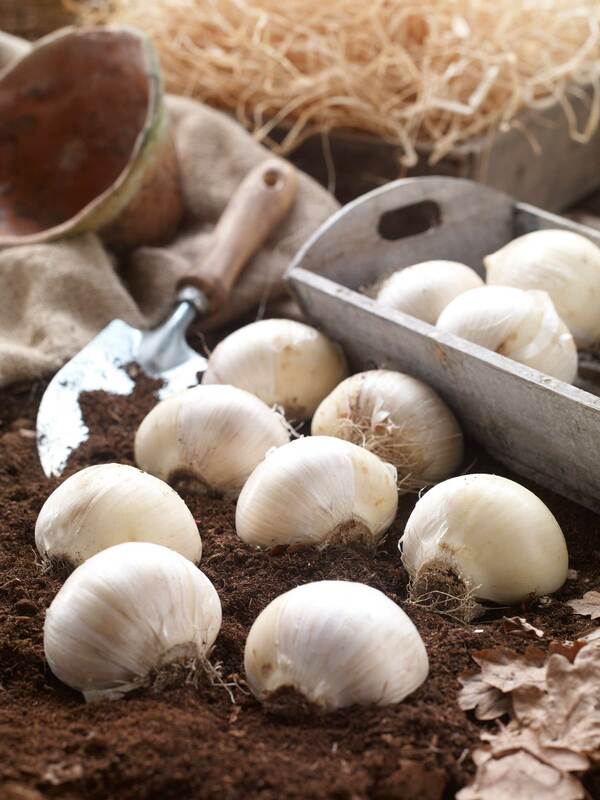 But growing conditions vary so much from one location to another, that it’s impossible to say (from here) which types of bulbs do or do not need to be pre-chilled. Getting advice from a local gardener is your best bet. Use this link to contact an LSU master gardener in your area: http://www.lsuagcenter.com/articles/connected/lmg%20programs%20in%20louisiana%20by%20parish. If that link doesn’t work, go to http://www.lsuagcenter.com and click on “find your agent”. 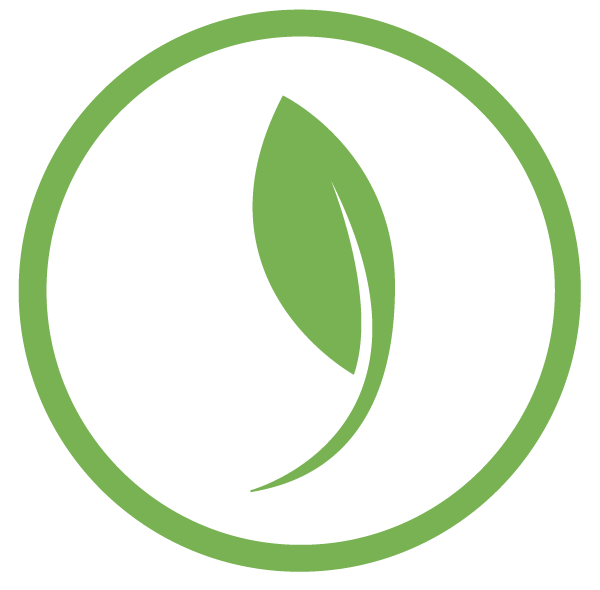 A full service garden center or nursery would also be able to help. Hope your spring dreams come true! I have one last question, promise! When the pre-chilling time is over, do the bulbs go straight into the ground? Or do they need to sit out or anything? Again, I’m so grateful! And I will make quick use of the resources you shared! You can plant them right into the ground! It may take you a couple tries to match the process to your growing conditions, but worth the effort. Also — the following bulbs should grow well in zones 8 & 9 without pre-chilling: Daffodil varieties Carlton, Erlicheer, Thalia and Avalanche. You can also try Dutch iris, Anemone DeCaen, Anemone St. Brigid, Freesia and Ranunculus. Ok I lied, two questions. I spoke to a grower at a local nursery. He was all in favor of pre-chilling all my bulbs, but he gave me different chill times. He said 6-8 weeks on most bulbs, 4-6 weeks on the alliums. If I chill them now, plant them in four weeks in Jan, would they bloom in February? That’s confusing and he rushed off the phone before I could ask. Yes!! I have many Ranunculus I am eager to try. Thank you so much for your help. How can I share your work? I’d like to return the favor somehow.